USC Pacific Asia Museum will host a delegation of monks from Karnataka, India, and the Drepung Gomang Institute to create a sand mandala in the museum auditorium over the course of five days, November 5-9, 2014. The sand mandala is a traditional Tibetan Buddhist art form that involves careful placement of colored sand in an intricate design that references the world in its divine form, a path for the mind to reach enlightenment and balance. Before creating the mandala, the monks perform a blessing ceremony with chanting and music to invoke Chenrezig, the Buddha of Compassion. During the ceremony, they use two traditional objects: a bell and a dorje (Tibetan) or vajra (Sanskrit), which is a ritual scepter. The bell is traditionally held in the left hand and symbolizes the female and wisdom, while the dorje is in the right hand and symbolizes the male and the “thunderbolt of enlightenment.” These implements are common motifs throughout South and East Asian art; several examples are in the museum’s collection. 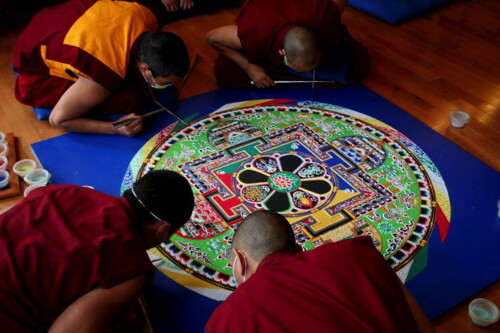 After the blessing ceremony, the monks begin the creation of the circular sand mandala. The multi-colored design is extremely labor-intensive, with up to four monks at a time working for days. Using a bronze funnel-like instrument called a chakpur and a bronze wand, the monks release a fine stream of sand by moving the wand across the grooves of the chakpur. The finished mandala is about four feet across. Once finished, a dissolution ceremony is performed and the monks sweep away the mandala and distribute the sand to those present at the ceremony.